Flybe‘s share price jumped on Friday after Stobart Group announced that it was considering a bid for the company. Flybe – which uses Avios as its reward currency – has been struggling in recent years, despite carrying 8m passengers per annum and operating more UK domestic flights than any other airline. The share price was 295p at the time of the 2010 IPO but has since lost 85% of its value and now has a market cap of just £100m. British Airways, which acquired a stake in the company as part-payment for the BA Connect regional operation, sold down its shares a number of years ago. The company was arguably a dead duck from the point in 2014 when it was forced to sell its Gatwick slots to easyJet in order to raise cash. 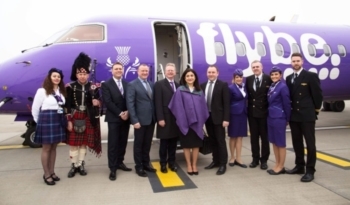 Stobart Group already operates Flybe flights under a franchise deal from the Isle of Man and London Southend, which it owns. It is also likely to use the brand for services from Carlisle Lake District airport which Stobart to about to re-open to passenger flights. Under Stock Exchange rules, Stobart Group has until 22nd March to make a formal takeover offer. British Airways is continuing to pick up aircraft wherever and however it can – within the EU rules – to fill the slots at London Gatwick which it recently acquired from the administrators of Monarch. BA has now signed a deal with Italian holiday airline NEOS – which to be honest I’d never heard of – to supply “a small number” of aircraft to run flights from Gatwick this Summer. If you find yourself booked on a NEOS plane, you will now receive free food and drink in Economy. Seat reservation fees will be refunded. If you do not want to fly with NEOS, you can ask to be moved to a BA-operated flight within three days of the date of your booked service, or receive a full refund of your ticket price. There will be no Club Europe service on the NEOS aircraft. BA’s cost-cutting literally comes to nothing …..
IAG, the parent company of British Airways, published its 2017 results on Friday. The share price fell sharply (5.7%) after the numbers were released. I have no intention of going through them in detail but you can see the slide presentation here as a PDF. The most astonishing number is on page 14 – CASK exc fuel for BA. CASK is ‘costs per available seat kilometre’. As we know from various BA management pronouncements over the last 18 months, the airline is now 100% focused on cost reduction. Every British Airways employee, every day, is permanently focused on cutting expenditure. Vueling cut its CASK by 0.9%. Aer Lingus cut CASK by an impressive 6.4%. Iberia couldn’t control costs so well and its CASK went up by 4.8%. And British Airways? CASK rose by a whopping 5.4%. Remember that this excludes fuel, which the airline cannot control. Heaven knows what would have happened if all BA employees were not 100% focused on cost cutting ….. It is also worth pointing out something interesting on Slide 27. BA’s ‘Plan4’, which is the catch-all phrase for the various customer-facing changes being made, is listed as a key cost reduction activity. Not, note, as an ‘investment’. Whilst the company may be claiming that it is ‘investing’ £400m / £600m or whatever the number is this week in Club World, it is telling the City that this is actually a cost-cutting programme. OT: Virgin ISAs…I’ve cancelled the Direct Debits to wife and my Virgin ISA accounts. If I want to take advantage of any points promos for these in the upcoming 2018/19 tax year can I just open new ones or do I need to either empty the old ones or do I need to actually close the old ones? Not sure of the usual terms (appreciate they could change of course). I’ve taken advantage of the offer for the past few years but have always withdrawn the balance as needed the cash for other stuff. If I wanted to keep the investments, Virgin are just too expensive. Thanks Genghis – have you just emptied the accounts out or actually closed them? I think once in the past I just emptied it out (which is easier as it can be done online) but then they said it couldn’t be closed because it had a zero balance!? OT: I have a BA Silver Partner Card going spare if anyone is interested. It needs to go fairly soon so let me know. If it doesn’t work out with Genghis I would be extremely keen, have a few BA flights this year and no status! Any advice on how to check whether my Gatwick BA flight to Bari in July will be on a Neos aircraft? ba.com shows the operating airline if you do a dummy booking. Virgin Trains East Coast – if travelling with a child under 5, I understand they go free (albeit without a seat reservation) however, if travelling in First Class, do they get the free food onboard? I would be very surprised if the Virgin staff gave you any trouble. They have certainly fed my kids in the past – admittedly I bought them a ticket anyway (to ensure we could reserve a four seat block to ourselves) but the staff didn’t know that. Thanks Rob, that how I see it. The catering staff don’t examine tickets. OT: Is there any update on the Virgin Money Virgin Atlantic credit cards? From what Rob said in January I was expecting them some point this month, but it doesn’t seem like that will be the case. We have signed an NDA. The CASK values for IB and EI are swapped, it was EI who decreased cost. Also the data are from the line which includes fuel cost.